At this age the toddlers are at a stage we call a “sensitive period” for language. This means that their minds are rapidly absorbing and seeking language. 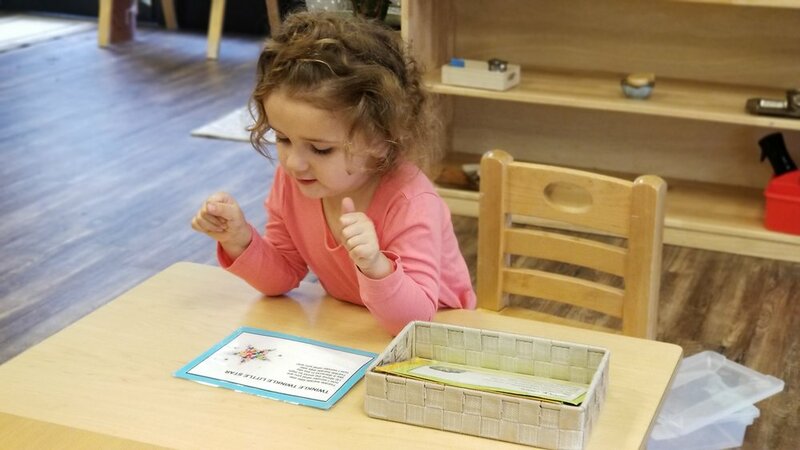 Through much study, Maria Montessori came to learn that this sensitive period lasts from birth up until age six. This helps explain why it is much easier for a child to learn multiple languages than it is for an adult; the sensitive period for learning new languages has ended for the adult. 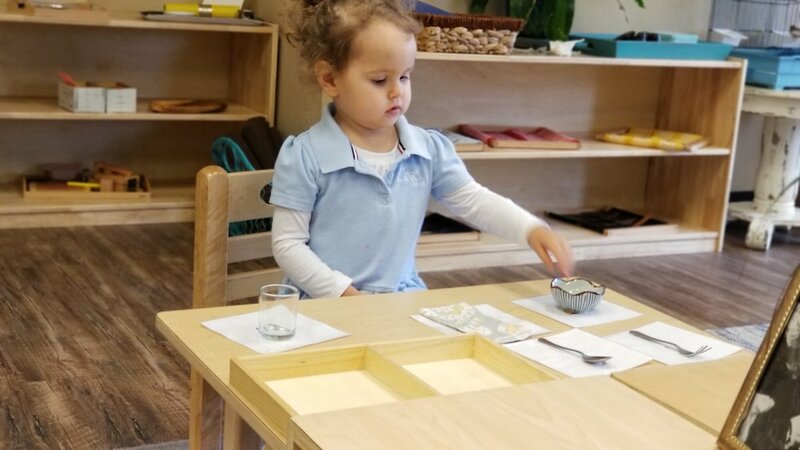 Having this knowledge the Montessori toddler classroom is set up with a fourth of the materials and lessons just for language alone! First, there are tangible materials for the child to work with. There are real items the child can interact with and have lessons with such as real fruits, vegetable, tools, plants, and more. 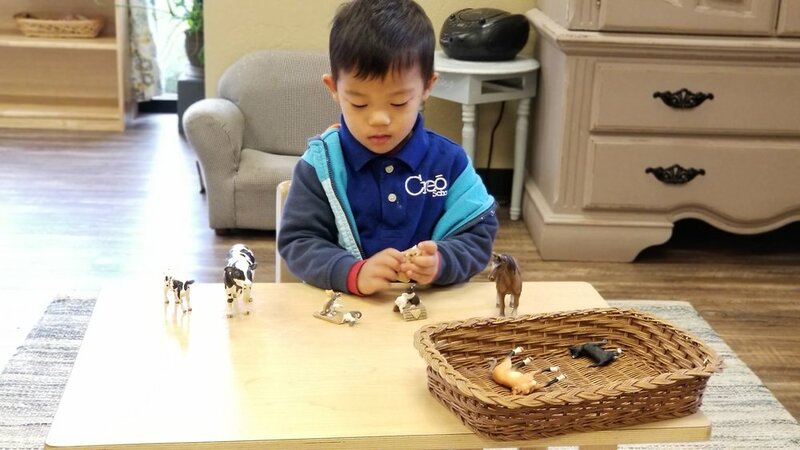 Then there are other materials that are replicas for of objects that the child cannot interact within the classroom such as wildlife animals, transportation vehicles, large home appliances and much more. The other aspect of the language materials are the language cards. These are pictures of items for the child to see and learn the names. There is a variety of these as well. 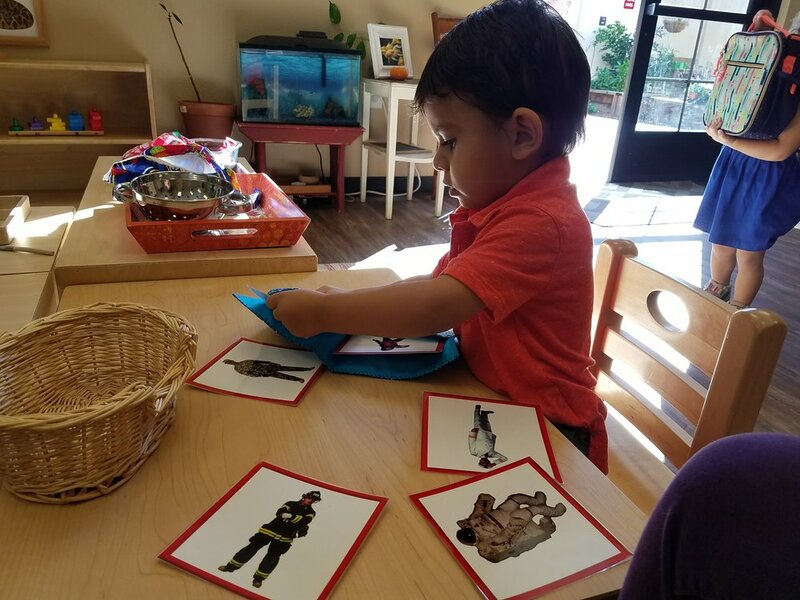 Some activities are set up to have the tangible materials matching with the exact picture card and others with similar pictures so the child learns there are different varieties of an item. On the language shelf, they also have other language cards of pictures of items that cannot be tangible at all, like ‘parts of a city’ or images of careers. These are great for the young child to be exposed to and begin to learn more about parts of their world! We make a great effort in taking advantage of this period of their lives to give as much vocabulary as possible. Often the toddlers go on nature walks around the campus and we name parts of the outdoor environment teaching names of plants, vegetables in the garden, parts of a tree, just to name a few. 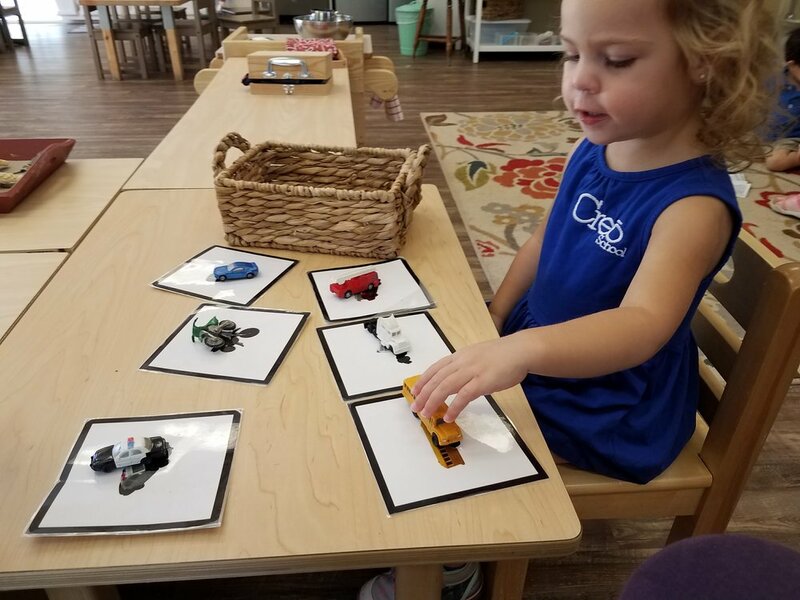 Throughout the day they have many ‘grace and courtesy’ lessons where we help them find and use the appropriate words to express their needs and wants, like how to communicate with a friend in class when they would like to share or work alone. Matching language objects to the exact pictures. Learning language items, parts of clothing. Learning language items, parts of animals. Looking at the picture book independently. One of the children’s favorite language activities in the class is music, poems, and books! Although they very much enjoy and take pride in working independently in the class they also enjoy having some group time. The books we read to the children are available to them all day on their bookshelf. After we read to them we often find them in the book corner “reading” the book to themselves, they repeat everything they remember about each page! For music and poems, we have the words printed on a card with a single image to help them remember. During the work period, they are welcome to use the cards. It's beautiful to see how they can remember the lyrics so well and help one another sing and recite poems. Most of the language activities are presented in a three-period lesson. The first period is Naming, teaching the child the name of the item (“This is a tulip”). The second period is Recognizing the item (“Show me the tulip”). And lastly is Remembering, we ask “What is this?”. The three-period lesson is given to the child with multiple items at a time, not just a single one. It is amazing to see their little minds absorbing so much knowledge!